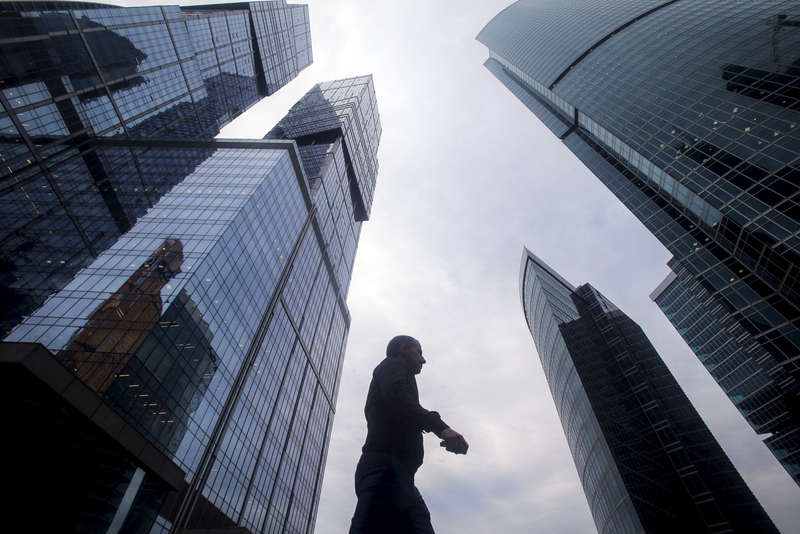 A man walks in front of the skyscrapers of the International Business Center also known as "Moskva-City" in Moscow. The Russian Finance Ministry has placed $1.25 billion worth of bonds on the open market. Furthermore, it has deliberately targeted foreign investors rather than local companies. Russian analysts say the government is pursuing sound economic policy. The Russian Finance Ministry has carried out an additional $1.25-billion placement of bonds on the foreign market. It has thus met its target of selling $3 billion worth of Eurobonds by the end of the year, hitting the cap set by the law, Russian Finance Minister Anton Siluanov has announced, as cited by the Interfax news agency. He said that the new bond issue had been mainly bought by investors from the U.S. (53 percent), with buyers from Europe accounting for 43 percent, and the remaining 4 percent going to Asia. There were no Russian buyers, while demand was six times the amount of supply, exceeding $7.5 billion. The Russian Foreign Ministry has therefore concluded that Russian bonds still present an interest to foreign investors, despite the sanctions. The first part of the issue was placed in May: $1.75 billion in 10-year bonds with a 4.75-percent yield. That placement marked Russia’s first foray onto the international capital markets since the fall of 2013. Then the total amount on the order book was about $7 billion and the buyers were UK investors. This time round, the coupon rate, i.e. the bonds’ yield, is 3.9 percent per annum, meaning that investors now have more faith in Russia as a borrower. The Western sanctions have prompted the Russian authorities to include some provisos in their prospectus, the main code of rules regulating an investment offering for sale to the public. Under that document, Russia undertakes not to use the funds it will receive from the bond placement to help companies and individuals included on the EU and U.S. sanctions list. Furthermore, if the sanctions are expanded, the Finance Ministry can pay investors not in dollars but in other currencies: pounds, euros or Swiss francs. All the raised funds will go to servicing the country’s foreign-currency debt or to replenishing its gold and forex reserves, says the prospectus. In 2016, the Finance Ministry has to allocate 164 billion rubles ($2.56 billion) for debt servicing, the RBK business daily reports. Experts point out that the Russian authorities are deliberately selling bonds specifically to foreign investors. “It is in the government’s interest to use foreign investors’ funds and to preserve those of domestic investors. In addition, when Russian debt instruments are bought by external investors, Russia ends up with a capital inflow, which is not the case when residents’ funds are used,” Konstantin Bushuyev, head of the market analysis section at the Moscow firm Otkrytie Broker, told RBTH. The Russian economy, he continued, is preparing to move out of recession and the state may be interested in raising new borrowing. The Russian authorities have chosen a good moment for the placement, market participants believe. “The Finance Ministry has made clever use of the placement window: The rating forecast has improved and there is talk of the harm being caused by the sanctions,” said Georgy Vashchenko, head of Russian stock market operations at the Freedom Finance investment company in Moscow. Earlier ratings agency Standard & Poor’s confirmedRussia’s sovereign credit ratings, having upgraded its forecast from negative to stable. Meanwhile, U.S. Vice-President Joe Biden said that as many as five EU member states were ready to lift the sanctions against Russia, though individual states can act unilaterally – the ultimate decision can only be taken by Brussels. Zvarich says that now is a good time for external borrowing. Given that yields generated by the sovereign bonds of some European states are below zero, Russian Eurobonds have become an attractive instrument in terms of the risk-to-yield ratio, he said.